"The Shape of Water" vs. "Three Billboards" – or Will They Have to Get Out for "Get Out"? Nothing was going to top the chaos and buzz of last year's Oscars, but the 90th annual Academy Awards felt like its age. Jimmy, Warren, Faye, and That Mix-Up! To Jimmy Kimmel's credit, the lengthy ceremony raced by. This may be the most fun I've had watching the Oscars in years." Part of that was because of last year's shocking "twisting ending," which became the "water cooler moment" of the broadcast. "La La Land" was announced as Best Picture – and then it wasn't. In a stunning faux pas by presenters and "Bonnie and Clyde" stars Warren Beatty and Faye Dunaway, it turns out the wrong movie was named. (They were somehow mistakenly handed the envelope for Best Actress, which went to Emma Stone for "La La Land.") Their error was acknowledged – as the world collectively held their breath and gasped – and then the actual winner was announced: "Moonlight" scored Best Picture in one of the most surprising upsets in Oscar history. Jimmy is back this year, and so are Warren and Faye – but I don't expect lightning to strike twice. If anything, I'm anticipating an even more by-the-books and controlled ceremony than usual, and that's really saying something considering how stuffy and rigid the Oscars normally are. The "safe money" seems to be on "The Shape of Water" or "Three Billboards Outside Ebbing, Missouri." 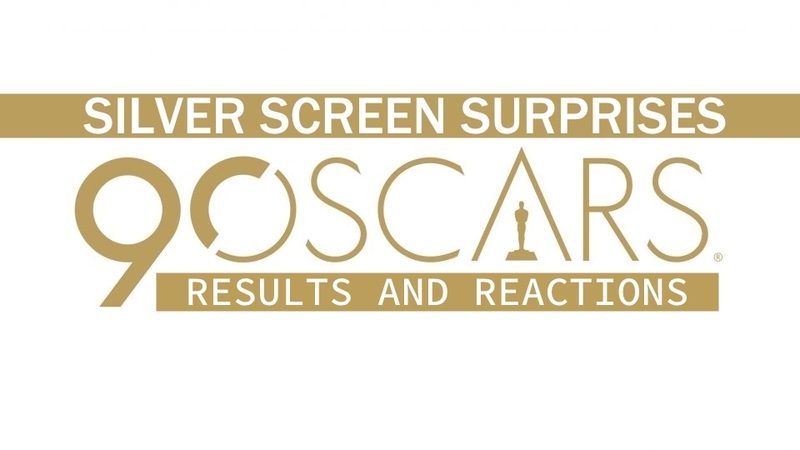 But will the entrenched "business-as-usual older Oscar voters split the vote between the two projected front-runners, paving the way for another film entirely to reap the big reward? Could the Academy's efforts to recruit a younger and more diverse voting base end up "playing spoiler" and pushing ahead a movie like the wonderfully creative and buzz-worthy "Get Out" instead? The Host: The opening monologue was more serious than usual. Only a few clever jokes broke up the unusually heavy atmosphere. Between Parkland, #MeToo, and #TimesUp, there's not much to laugh about these days. As Kimmel said later on, "reality can be depressing." Still, Jimmy is a natural and can easily do this for another ten years like Billy Crystal and Bob Hope before him. Best Oscar Speeches: The speech by the winners of "Coco" about representation – people of all races, colors, and creeds needing to see themselves on screen – was possibly the first great one of the night. Rachel Shenton and Chris Overton using sign language during their entire speech for "The Silent Child" was amazing – and quite fitting considering both the subject matter and star of their movie. I loved Jordan Peele's speech for Best Original Screenplay. He talked about wanting to give up 20 times because he didn't think anyone would ever actually agree to let him bring "Get Out" to the screen. I'm glad he kept writing, because not only did he get to make his movie, he won the Oscar for it. Frances McDormand – long overdue for an Oscar – made an impassioned plea for women's rights and equality. She mentioned the term "inclusion rider" in her speech. What does that mean? According to The Hollywood Reporter, she's asking for "requirements in contracts that provide for gender and racial diversity." I expect that to be the most talked about issue brought up at the Academy Awards, both within the industry and by the moviegoing public at large. Best Presenters: Eva Marie Saint – who admitted she's older than Oscar – did such a classy job of recapping her career and presenting the award for Costume Design. Taraji P. Henson positively beamed when she revealed that Mary J. Blige is the first person ever nominated for both Best Song and Best Supporting Actress in the same year. Lupita Nyong'o and Kumail Nanjiani – two names people "have trouble pronouncing" – were funny, charming, and inspiring. They recounted their journey to the film industry as immigrants from Kenya (Lupita Nyong'o) and "Pakistan and Iowa (Kumail Nanjiani) – two places people in Hollywood can't find on a map." Tiffany Haddish and Maya Rudolph were hilarious. I love Tiffany Haddish! Warren Beatty and Faye Dunaway made the most of their second chance. Their presentation was short but sweet. I was hoping they would announce a winner that wasn't even nominated – a terrific punchline to last year's monumental mistake – but no one was willing to be that daring this year, much to the show's detriment. Best Moments: Jimmy Kimmel announced that speeches wouldn't be interrupted by music this year. Instead, Lakeith Stanfield ran out and re-enacted a scene from "Get Out." Oscar winners whose speeches are too long, Kimmel said, will have to "get out." Cute! The "Price is Right"- like jet ski contest for shortest speech – which was won by Costume Designer Mark Bridges. Best Dressed: I don't usually care about this, but the timeless Rita Moreno was in the same dress tonight that she wore 55 years ago when she won the Oscar for "West Side Story" in 1962 – and she pulled it off spectacularly! Biggest Surprise: None in the major categories. Both Documentary awards and the Live Action Short Film winners went against general projections. Otherwise, this was the most predictable Academy Awards in years. Overall: There were a few good lines, and Kimmel is a comforting presence, but this year's ceremony felt too safe and stuffy. After last year's fiasco, it seemed everyone went out of their way to avoid making any mistakes at all. There were a few good zingers and moments, but almost everything was too buttoned up and restrained. The winners were predictable, and with an overabundance of musical acts, video tributes, and skits, the show was too long. Best Actor in a Leading Role: Gary Oldman, "Darkest Hour"
Best Actress in a Leading Role: Frances McDormand, "Three Billboards Outside Ebbing, Missouri"
Best Actor in a Supporting Role: Sam Rockwell, "Three Billboards Outside Ebbing, Missouri"
Best Actress in a Supporting Role: Allison Janney, "I, Tonya"